I’ve been seeing mangoes a lot lately. Sweet, juicy, yellow fruit. There are also literal heaps of green (unripe) mangoes along with the bright yellows. And if life hands you green mangoes…you make “buro”. Buro literally means “to ferment” or “fermented”. But if you’re on the verge of freaking out, keep in mind there are many types of fermented foods you probably already eat as kimchi, sauerkraut and yogurt. Bulacan and Pamapanga have traditions of placing fish in with cooked rice, salt and a powdered red “starter” called angkak that produces, after a few weeks, the nicely tart condiment known as balo-balo in Pampangueno or simply as buro in Tagalog. In the case of green mangoes, I think the process is a lot more closer to pickling more than anything. This version is adapted from one of Marketman’s recipes and approximates the sweet/salty/sour preserved mangoes you find in Binondo or those found in corner shops inside groceries along with all the champoy. It’s easy! 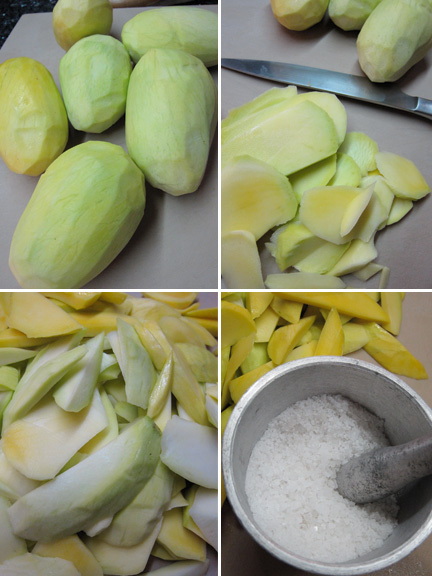 Peel and slice six medium to large tart green mangoes and place them in a bowl. I like them in thinner slivers. Others like them finger sized. Mix together a slurry consisting of 2.5 cups of white sugar (yes, it’s a lot), 1/2 cup white vinegar (cane vinegar is fine), and 3/4 cup non-iodized rock/sea salt and pour over the mango slices. Mix. Leave and let sit for 8 hours or overnight. 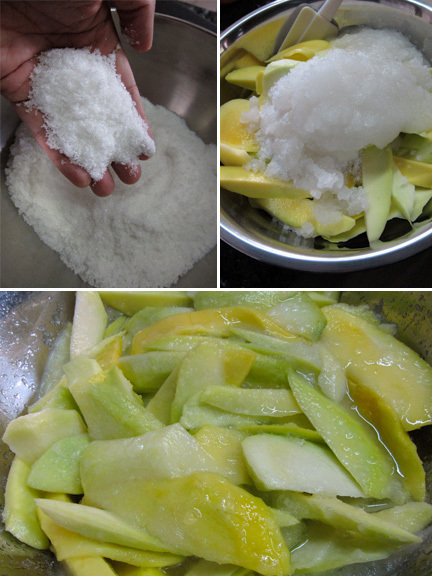 This process draws out quite a bit of moisture, softens the raw flavor (pakla) of the mangoes and salt cures them slightly. The mangoes will shrink a bit and will be swimming in its own sticky syrup the next day. Drain the mangoes. Reserving a bit of the liquid if you prefer to use in the fermentation stage. Top with 3/4 to 1 cup of beer. I had some Red Horse at home and used that because of its sweetish taste. But otherwise, use whatever (light-colored) beer you prefer. Mix again, seal the lid and leave in the fridge for at least 5 days. If you can resist eating it. Though it’ll taste better maybe after a week or so. 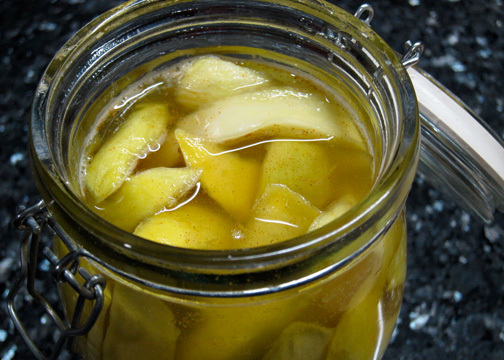 Goes very well with fried and grilled foods as a condiment. And adobo. With lots of steaming white rice, please. I just love this, so simple yet full of flavor. Great comfort food! Wow! Love this!! Do you think this will work with pajo?